An entertaining dice game for all ages. Roll the dice and select the total from the available cubes. See how close you can get to a perfect score of 78. 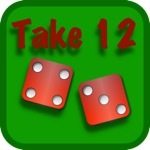 Take12 is a dice game that I played at my grandmother’s when I was a child. It kept me busy, and possibly out of the way, for hours. It is still quite enjoyable to play. I have recreated this game for iOS. It is a fairly simple game that is easy to learn but hard to win. This game has a 2.5 star rating (10 ratings). It occupies the 931850th position in our ranking with 27 points.